Cloud Connectivity and Security for Every Branch With each new branch and remote employee, your distributed networks become more complex, and your organization’s digital transformation continues moving full speed ahead. Traditional networking and security infrastructures often buckle under the pressure. 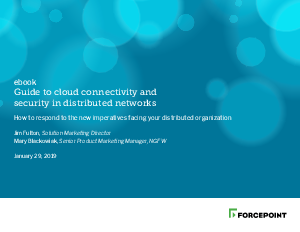 In this ebook, Guide to Cloud Connectivity and Security in Distributed Networks, we’ll share a better approach. Integrating connectivity and security, and moving them to the cloud, can help you achieve higher productivity, reduce cost, and ease compliance. Read our ebook for more on how to connect and protect across your distributed networks.